Flickering the lights definitely does not work to grab your students' attention! 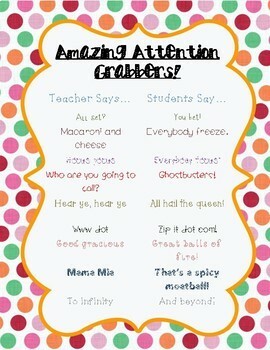 So, how do you grab your students' attention? 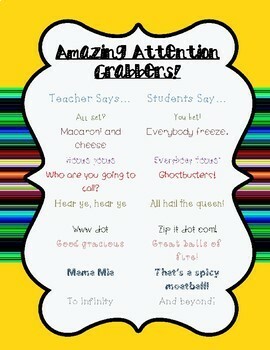 My favorite way to get all of my students' focus is with an Attention Grabber! For example, a personal favorite of mine is when I say, "Hear ye, hear ye." My students reply, "All eyes on the queen." Starting the first week of school, I have my students practice our new procedure. After explaining that when they hear the Attention Grabber, they repeat their part and then freeze, so they can hear my directions. We then practice this over and over until they get it perfectly. I start off with one attention grabber for at least 3 days. 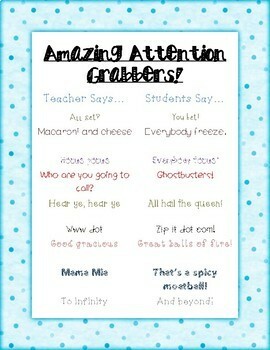 (I get these from the Attention Grabber Poster and go down the list.) This ensures that the students understand them completely. Once we have gone through all the attention grabbers, I mix them up. If, at any point, I find that my students aren't responding correctly, we take them time to review our original procedure. After a long break, I definitely review this with my students! I have created a set of 6 mini-posters that you can download free. Click on any of the pictures below to get your copy.